This is a holiday house with WOW factor. Approached down a tree lined drive and set in large, beautiful gardens with lovely countryside views, it is just made for an idyllic family get together. 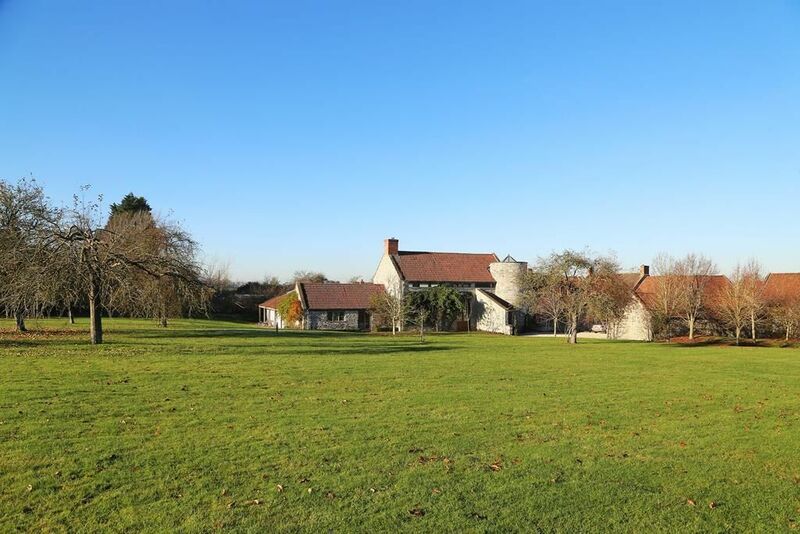 Built of local stone and with a magical crenelated tower, there is something for everyone, including a hot tub, cinema room, table tennis, pool table and lots of space. The house has many quirky features with accommodation including a large dining hall with cathedral height ceilings and minstrels gallery to a Roman inspired decked atrium with hot tub. The house is beautifully furnished in peaceful creams and beiges with lots of different seating areas for all. The cosy drawing room is bathed in sunshine and overlooks the garden, the sofas on the galleried area look down over the dining room, and there is even a cinema! The kitchen is equipped with everything a chef could need is light and airy with one wall covered in signatures of visitors to the house including several famous bands and actors as you would expect so close to Glastonbury. All the bedrooms are spacious and light with White Company linen and comfortable beds with bathrooms stocked with 'Bramley' toiletry products and each having a charming view of the gardens. Outside there is plenty of space, including a lovely flower filled courtyard, the beautiful lawns that surround Hill House and plenty of seating with a BBQ. Finally, as you enter, there is a large basket full of champagne and wine corks to remember the happy times guests have had in the house. The owners are hoping that everyone staying will add to the pile as a special memory of their stay - we know you will happily oblige!